This is light, fresh, and filling. The mint and lemon add brightness, while the cumin and sun-dried tomatoes keep everything earthy and grounded. We ate it for dinner with baked sweet potatoes and sautéed kale, though it would be equally as good on its own for lunch. No further introduction needed. Heat the olive oil in a large skillet. Add the cumin seeds and red pepper flakes. Cook, stirring, for 1 minute or until the cumin is toasted. Add the minced garlic and cook on medium-low for another minute or two, until the garlic is golden. Add the chickpeas and tomatoes to the skillet and cook, stirring occasionally, on medium-high until the chickpeas are warm. Meanwhile, in a separate bowl, combine the parsley, mint, lemon juice, and cucumber. 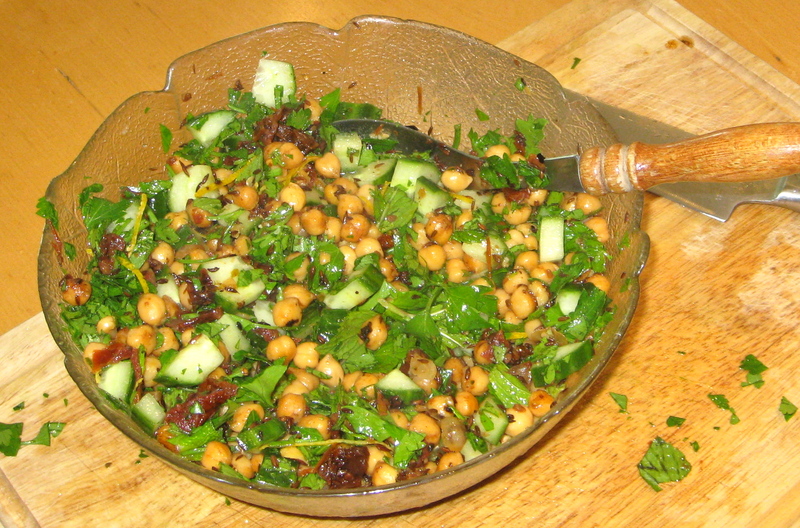 When the chickpea mixture is cooked, add it to this bowl. Salt to your taste and toss, the refrigerate for at least an hour before serving. This entry was posted in food, health, pictures, recipes and tagged salad on 26.04.2013 by taplatt. Perfect, Katherine! Glad the timing worked out for you — and that’s amazing you found chickpeas and tahini in Ukraine…hope they don’t break the bank for you!